Welcome to the introduction page for My Movies 5.10. 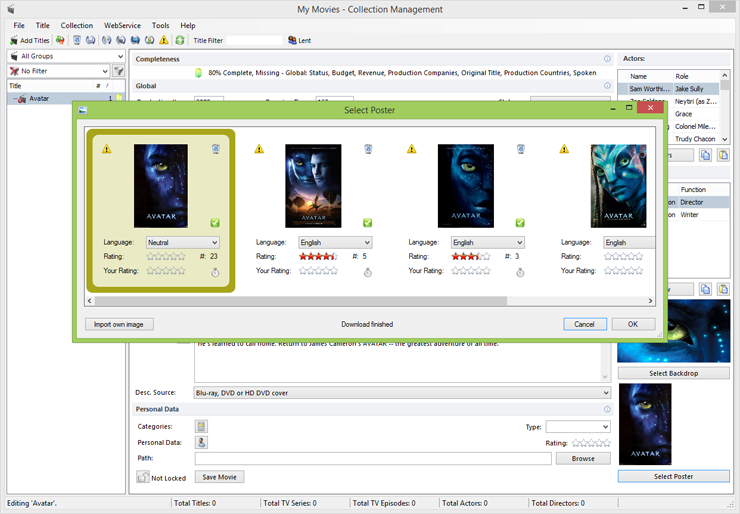 My Movies 5.10 introduces support for generic movie profiles in My Movies, a feature that was originally planned for My Movies 5, but was postposed to be able to deliver the My Movies 5 software package quicker. With the introduction of generic movie profiles, we are adding a third meta-data offering to our service, so that there are now Disc Titles (DVD, Blu-ray, HD DVD), Movies and TV Series. The purpose of introducing movie profiles are to provide better support for users content that are not specifically on disc titles, such as digital downloads, but it can also be used to track older media such as VHS, LaserDisc and similar, but without support for barcodes. The functionality is also created alongside new groups "Digital", "Seen" and "Interested", with the intention of allowing you to track also what you perhaps have seen in cinemas or upcoming movies that you are interested in. Besides this, users of Windows Media Center who prefer to view their disc title based collection with movie theater posters and movie data rather than the disc specific data, can now choose that through settings in My Movies in Windows Media Center, under "Movie Library". But is DVD and Blu-ray's not movies? DVD and Blu-ray media certainly can contain movies, similar to how they can contact TV Series, but still, there are several reasons why our data for disc titles are not ideal for use with product features for digital downloads. Examples are that DVD and Blu-ray titles have audio track languages and subtitle languages that typically do not represent what a digitally downloaded file contains, descriptions may refer to offerings that are specific for the individual disc title releases, and studios releasing a disc title may not always be the same as production companies involved in the creation of the movie. We have created a page which explains the difference between disc titles and the new generic movie profiles in details. It is recommended that you read this page here. Initial Data Limitations - We need your help! We have decided on providing movie meta-data through our own service, rather than basing the functionality on other services such as themoviedb.org - to be able to deliver the feature set we would like, it is important for us to have full control over the data through our own service. Through our online service, we have for a while had an option to contribute movie theater posters for movies, as well as movie backdrops, but we have not had specific generic movie meta-data. To have an initial offering of data, we have therefore build a database that is based on a combination of the contributed movie theater posters and backdrops, and, an import of data from our disc title database, on data that is directly transferable, based on most popular profiles. This means that we have a relatively good coverage initially, but it also means that there may be glitches in the data, such as titles that include unwanted text, or titles where the description refers to the DVD or Blu-ray specifically, and it also means that there are some data that is not available on any profile, because it is not directly transferable from disc titles. - Contribute movies that does not exist. You will typically see this by not having a + sign next to a movie disc title in your collection, where the movie profile would normally exist as a sub node. You can right click a disc title and select 'Create movie', which will also check to ensure that the title does not already exist in the online service. - Correct titles that you find to contain unwanted text that may refer to a disc title, multi disc title or similar. This is not data that is incorrectly contributed by others, but comes because of some of the data coming from disc titles. - Correct descriptions that you find to refer to disc specific content. - Contribute translated descriptions and titles if your primary language is not English. This especially important to have a good international coverage. - Contribute data that is lacking from the profiles. You will of course earn contribution points for added data, but as with our existing database, we cannot give contribution points for changes to existing data - we do hope that you will help us correcting incorrect data anyways, for the benefit of everyone. Our contribution introduction page will contain details about earned points. 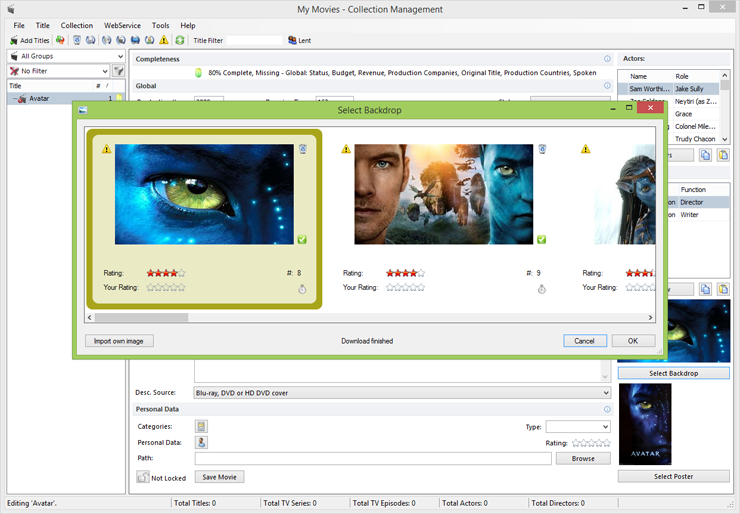 Once having installed My Movies 5.10, open the Collection Management program, and the application will offer to download movie data profiles for titles in your collection - this will download a generic movie profile for disc title in your database, that is registered with Media Type 'movie' and where a matching movie profile exists, and place it below the disc title in the title list. This new profile below the disc title is now also the way of working with backdrops inside the Collection Management program, rather than on our online website. Disc title profiles with Media Type 'movie' and where a matching movie profile exists, will now always have a generic movie meta-data profile below it, but everything else regarding disc titles remains as it has always been. It is our intention that you in the future will get functionalities to allow your disc titles to be represented with movie specific data in Windows Media Center. Besides the sub-profiles for disc titles, you can add movie profiles on it's own, for any media you have where movie data is preferred over disc titles, such as digital downloads. You can also use the folder import functions, and folder monitoring functions to import movie data rather than disc title data, or, you can surely also continue to use just disc title data in your collection, or, you can choose to let import and monitoring functions combine the usage of disc titles and movie profiles, allowing specific disc media (VIDEO_TS folders, BDMV folders and ISO files) to receive disc title data, while other media will receive movie data. With the introduction of movie elements in My Movies, the icons in the title list in Collection Management have been updated to better differentiate between the different element types. You can see the new icons here. The user can select a preferred poster, or upload and contribute new posters to the online service. Selection of movie backdrops are now available both for disc titles and movie profiles within the Collection Management application. The movie profiles are introduced specifically in My Movies for Windows, and will currently be unavailable in mobile applications and the online collection. It is planned that a release for iPhone and iPad will be introduced very soon, followed by an Android release later. Timelines on releases for Windows Phone, Windows 8 and the online collection is not yet known.